Daikon is a radish that is long and white and grows very easily. I have it growing at the moment and have too many, so decided to put it in a prawn recipe. It complimented the rice and was not at all bitter like some radish is. I have baked the risotto instead of cooking it on the heat, and the smell of the coconut cream as it was baking, was delightful. Preheat the oven to about 160° fan forced or 180° ordinary. Put the stock and lemon grass into a saucepan and heat, adding half of the kaffir lime leaves. Bring to the boil, reduce the heat and simmer covered for about 5 minutes (longer if using fresh lemongrass). 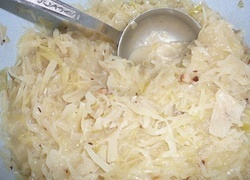 In a casserole dish, add the chopped onion and cook for about 4 minutes or until the onion is soft but not brown. Stir in the curry paste and cook another minute. Add the coconut cream and the white radish (Daikon) and stir. Cover this, and bake for 15 minutes. Take out of the oven and stir the risotto, then bake another 10 -15 minutes. Add the prawns and mix them well into the rice. Bake for another 10 - 15 minutes or until the prawns are cooked through, and the rice is soft. Serve and garnish with the remaining lime leaves and shredded Daikon. Do you still wear short skirts?